Work on this abandoned coastal fort on the edge of the national park a couple of kilometres north of Verdens Ende started in 1939 and was continued by the German occupying force during the war. It was completed in 1941. It was armed with four 15 cm Bofors L750 cannons with a range of 19.5 km, three of which can still be seen. 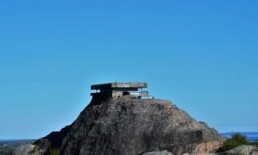 The fort was closed down in 1999. The area is open to the general public.